In the coming weeks, I’d like to devote some time to parrot tricks. My work with intelligent, social creatures such as parrots, elephants and marine mammals, has convinced me that the true value of training does not lie in the amusement value of the tricks (undeniable as that is!). Rather, it is that a properly trained captive is much more likely to fit easily into the unnatural world it inhabits. I’ll start here with some thoughts on the essential nature of our feathered pets, and how we might approach parrot training in a way that is both effective and enjoyable (for parrot and owner!). Thrusting complex, social animals into an unfamiliar world is a recipe for disaster. Such creatures are interesting to be around, yet they have learning abilities, instincts and social needs that are largely impossible to fill in captivity. It is no coincidence that sea lions, parrots, primates and elephants have long been at once both the most sought after and highly frustrating of captives. Observe great apes in the wild and you will quickly realize that today’s multi-million dollar exhibits cannot begin to meet their needs. With parrots, however, we can do better – if we take the time to observe and learn. The essential key to a stress-free relationship between yourself and your parrot is a clear understanding of exactly what a parrot is, and how evolution has shaped it to survive. However well-intentioned, viewing any animal as a “fur or feather clad person” will ultimately confuse and frustrate both pet and pet owner. A bird which is not trained in a way that respects its unique characteristics, which have evolved over millions of years, will in almost all cases lead a stressful existence – unaware of where its limits lie and, bright as it may be, completely in the dark as to why we act as we do. Wild parrots are preyed upon by a wide variety of animals, from ocelots in Panama to amethystine pythons in Australia. Their instincts and impressive learning abilities are directed towards escaping capture, not making friends with huge, strange beings. Add to this the fact that confinement cuts down the instinctive flight distance (the point to which the parrot will allow a threat to approach before fleeing) dramatically, and you can begin to see the problem. Of course, with care, we can modify instinct, but the bird’s essential nature will remain…please keep this point in mind. We cannot approach a parrot as we would a dog. Dogs are predators, and their way of “viewing the world” differs radically from that of a prey species. Dogs have been living in association with people for over 15,000 years, and are fully domesticated (despite this, most mammalogists consider them to be subspecies of the gray wolf, not a distinct species). Although parrots have been kept sporadically since the times of ancient Rome, serious interest is a new development…even those bred for hundreds of generations (i.e. budgies, cockatiels) are not domesticated in the true sense of the word. Understanding of your parrot’s needs is the first step in creating a good relationship. 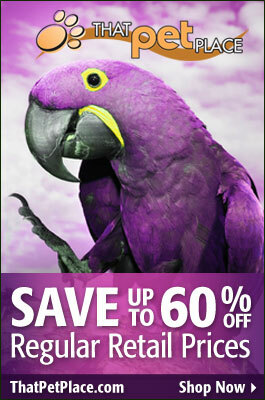 Please check out our comprehensive line of Parrot Care Books http://www.thatpetplace.com/pet/cat/info/22314/category.web. You can learn how instinctual parrot behaviors often lead to misunderstandings between bird and owner at http://www.silvio-co.com/cps/articles/1997/1997blanchard1.htm. I feel peoples biggest stumbling block when owning and building trust with a parrot is, understanding that they have a breeding seasons as they mature. And that the lack of a mate, leads to aggressive/loud behavior, for this short period of time. And all to often people get bit and respond negatively, thus breaking their bond with the bird.If you take on a relationship with a parrot understand that when the days start getting longer,spring-time, your bird WILL be more vocal AND more FRUSTRATED. Every year starting around the age of 4 or 5 years. I lived with parrots for 25 years and they all still have their feathers and let me handle them. One other thing about parrots is that they are generally monogamous creatures. Meaning they DON’T make good family pets. They just want one mate/partner. And the bird picks the partner, not you. Thanks for your interesting comment. As you suggest, the effects of breeding biology and hormonal changes are under-appreciated by many parrot owners.